1. Where it is established, on the basis of proof or circum­ stantial evidence as described in the two lists mentioned in Article 22(3) of this Regulation, including the data referred to in Regulation (EU) No 603/2013, that an applicant has irregularly crossed the border into a Member State by land, sea or air having come from a third country, the Member State thus entered shall be responsible for examining the appli­ cation for international protection. That responsibility shall cease 12 months after the date on which the irregular border crossing took place. 2. When a Member State can not or can no longer be held responsible in accordance with paragraph 1 of this Article and where it is established, on the basis of proof or circumstantial evidence as described in the two lists mentioned in Article 22(3), that the applicant — who has entered the territories of the Member States irregularly or whose circumstances of entry cannot be established — has been living for a continuous period of at least five months in a Member State before lodging the application for international protection, that Member State shall be responsible for examining the application for international protection. If the applicant has been living for periods of time of at least five months in several Member States, the Member State where he or she has been living most recently shall be responsible for examining the application for international protection. (REGULATION (EU) No 604/2013 OF THE EUROPEAN PARLIAMENT AND OF THE COUNCIL of 26 June 2013). In this sense, every person that gets into Germany, for example, without papers could apply for asylum even if he/she started a procedure in another county. For land or sea the most common countries of entrance to the UE are Spain, Italy, Greece. The european migration phenomenon has same causes than the american (continent) migration phenomenon: wars, poverty, violence. Also has same effects: border securitization & militarization, racism and illegal politics of migrant persecution (like stop people on the street and ask for their visa or the use of internment camps for migrants without papers). The result: an absence of human rights and a crisis of humanitarian defense. So, in a lot of the countries that experiment (not necessary be affected by) migration flux, social organizations and networking groups are helping the people that arrives by sea or land, but obviously it isn’t enough to support all of them. The solutions seems to by easy, but the political enforcement makes some times difficult. However, in some cities of Spain, like Barcelona and Madrid, governments are applying an immediately public solution: to provide temporal asylum for refugees by the support of the people that are opening their own houses, Derrida calls this action City-of-refugge. This is an important difference between the government response in crisis like that. In Mexico, for example, catholic shelters assume this responsibility because governments only reinforce borders with security programas, not human rights or social-economic public policies, and a few some social organizations, like “Las Patronas”, assume this humanitarian labor. Other european cities are supporting refugees by public manifestations. Unfortunately the problem won’t be resolve until we look for a global solution that has several faces, specially economic and politic. This situation doesn’t deny that most of the european governments immediately act to try to resolve the superficial problem: asylum seeker for refugees. Right now is time to think in solutions that minimize the migration as an escape from wars or violence, same as we observe in Mexico, and rethink the migration flow as an option of way of life that could be temporal or definitive, for work or pleasure. 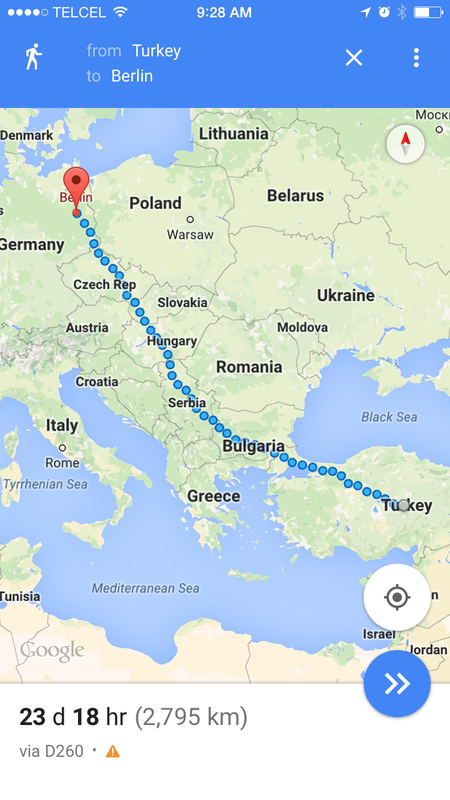 So, I did an exercise with google maps for compare but continents and the result is interesting: a Syrian or a Central American migrant walks a similar amount of kilometers until them arrive to their destinity. Most of them pref er to go as far as they can from the first border that they cross in first place. And all of them have to cross a lot of different kind of borders and confront a lot of restrictions and punitive attitudes not only by the police also by the community. maps app. A walking route. If we compare different routes in both continents, the main distinction is that Central American migrants only crossed one huge vertical border (that measure the same that it’s northern border: Mexico). Meanwhile, Syrians cross a lot of countries that right now are redefining their own borders, an aporia for the ideals of EU. We need time to observe the changes that refugee crisis provide and provoke to the european societies, as well as we observed these in Mexico and Central America, unfortunately the results have not been what we desire until now.